ANT_0 n/a Provides omnidirectional transmission and reception of signals between the Network Extender and communicating Verizon Wireless mobile phones. 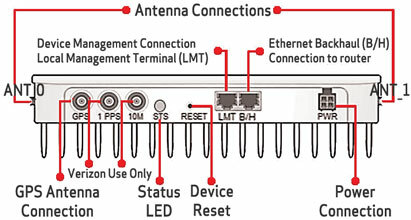 ANT_1 n/a Provides omnidirectional transmission and reception of signals between the Network Extender and communicating Verizon Wireless mobile phones. GPS Antenna Connection Mini-coax Allows connection to GPS antenna and / or antenna extender. Status LED n/a Indicates the status of Network Extender connectivity to the Verizon Wireless network. Refer to Meaning of LED Status Indicators for assistance. Device Reset Recessed Button Resets device to factory specifications. LMT Modular 8-pin (RJ-45) Ethernet jack Local Management Terminal. Device management connection. B/H Modular 8-pin (RJ-45) Ethernet jack Ethernet Backhual Port. Allows connectivity to the modem/router. Power Connection ATX 4 Pin Male connector Power adapter connection. 1 PPS Mini-coax Not currently used. 10M Mini-coax Not currently used.